RIO DE JANEIRO, Brazil, December 10, 2012 (ENS) – As we approach the date for the Mayan doomsday prophecy on December 21, 2012, and the nature and history channels fear-monger the demise of our modern civilization by magnetic solar storms destroying digital based satellite telecommunications, I’m sitting here trying to figure out what will happen to our 10 year-old analog television. The analog and digital divide approaches Brazil in 2016, when all television transmissions will be digitally broadcasted. About 150 million televisions will become obsolete in Brazil, having a direct impact on more than half of the population. The Olympics will also coincide with this flip of the digital switch, forcing poor families to hurdle through various obstacles to purchase new digital televisions. 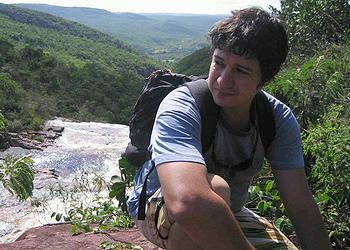 Recycling technological materials in Brazil is a daunting task. Brazil is the largest producer of electronic waste in today’s emerging economies, producing approximately 600 grams of residues per person a year. There are more cellphones than people in Brazil and this number is expected to grow as the lifespan of a cellphone decreases to about two years. Computers have a longer lifespan, typically reaching three to five years. In the world, about five percent of all the material waste produced is electronic hardware in nature, adding up to roughly 50 million metric tons per year. Brazil faces various obstacles in reducing its digital trash and is really missing on a gold mine, literally. Electronic hardware from cellphones, televisions, computers, and household appliances contain valuable metals, including gold, tin, and copper, among others. There are great ambitions but very little infrastructure for a proper Brazilian digital ecosystem to collect and dispose of electronic equipment. In fact, the National Plan of Solid Residues (PNRS) will require that all producers of electronic hardware develop an internal industrial ecological plan, called reverse logistics (logística reversa) that will be mandatory by the year 2015. Attending a conference on corporate sustainability sponsored by Sebrae (Brazilian Service Support for Micro and Small Enterprises) this month, I spoke with various professionals in the Green IT business realm, and also got a chance to speak to leaders and representatives for various recycling cooperatives in Rio de Janeiro. What I learned from the workshops is that Brazil has a long tradition of successful recycling cooperatives, but none are big enough to make an impact on the state level, much less at the national level. The main obstacles to recycling technological material residues are: lack of logistics and communication; lack of recycling by the general public; lack of government support for recycling businesses, including capacitation and specialization for workers; and lack of capital investment for equipment. Brazil has only one automated machine in São Paulo that crushes televisions and separates materials, such as metals and glass. The owner of this machine is stockpiling materials that don’t have a market value yet, such as phosphorus, with the intention to sell them in bulk once the open market creates demand. This machine costs about US$120,000, while a non-automated version costs US$60,000, which is really a drop in the bucket according to the attendees of one of the Green IT workshops. 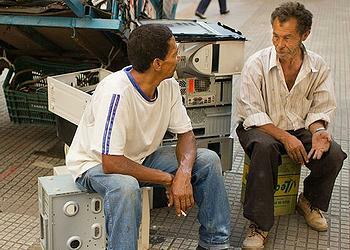 Rio has no such machine and old televisions are broken and scavenged for copper. The remaining materials that are toxic in nature, such as lead, get mixed in with the rest of the city garbage. Batteries are one of the biggest problems in the Digital Age because of the cancer-causing materials they are made of such as beryllium, mercury, and lead. The majority of these batteries end up in the local landfills in Rio, posing a threat to all citizens living here. There is no present value for this material. Two supermarkets in Rio – Pão de Açucar and Extra – have a campaign to collect batteries. Santander Bank also has a recycling initiative where members of the public can enter any one one their branches and discard batteries in a designated drop box. Interestingly, analog equipment such as vacuum tube based communication radio gear sells for a lot of money in countries like Japan. As people run to get rid of their digital technology gadgets in Brazil, in Japan people are running to get old analog technology. If digital systems do fail, vacuum tube communication may be the only way for us to stay in touch.